As calls to prayer filtered in through the ventilation system of his makeshift spray booth on Bedford Avenue, painter James Miller spoke to us about his recent work, his process, and his multifaceted practice. Although unmistakeable as anything but as a painter, James’ practice is strengthened by both his investigations of projected light, and his use of collected detritus. It is the unexpected physicality of Miller’s practice, as well as his tangible and palpable negotiation of color that led us to this conversation. Mariana Garibay Raeke: James, what are you working on right now? 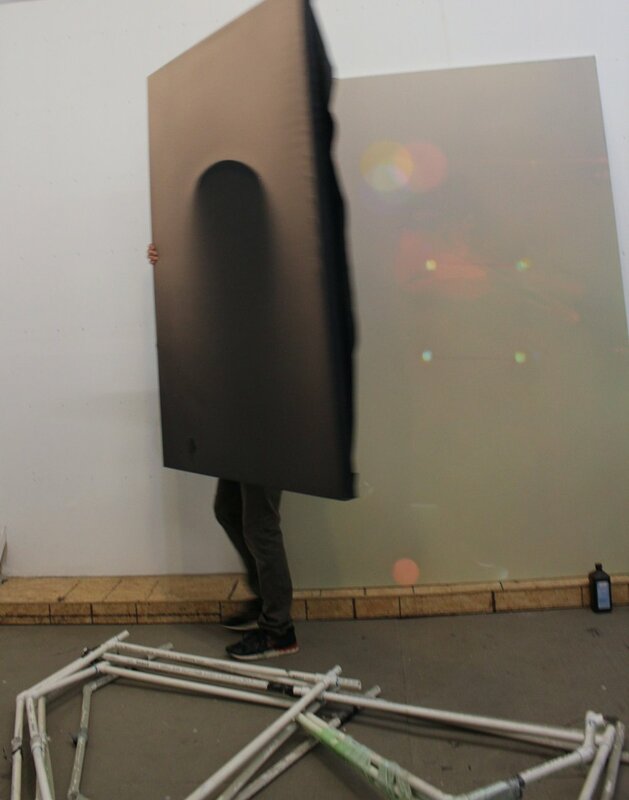 James Miller: I’m trying to make some negatives - black paintings on transparencies - for a project called ‘‘plates of the present’ based out of Paris run by Thomas Fougeirol and Jo-ey Tang. 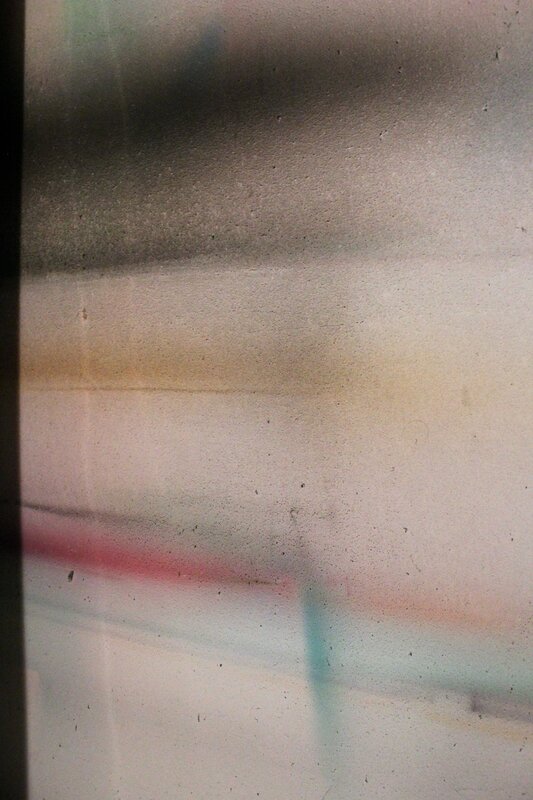 It’s an ongoing experimental photography archive. Thomas has a makeshift darkroom in his home and they invite people to visit and experiment with direct photographic processes. I am sending them a series of negatives from New York, and they will burn them onto photo paper. This is the first time I’m making something that’s actually using photographic material. Untitled (in progress) negatives. 2016-17. Enamel and India Ink on mylar. 16 x 12 inches. Martha Tuttle: That’s kind of incredible considering your work can appear so grounded in the photographic and image residuals. When did these processes enter your practice? JM: It happened in grad school. I was trying to work myself out of making paintings and my work got really immaterial for a little while. I got to take Sarah Oppenheimer’s projection class in grad school, which focused on the use of both analogue and digital technologies. I spend a lot of time exploring projection and playing with colored light and began to see color theory in a new, physical way that blew me away. This was the first time that the experience of light phenomenon was being broken down, and explained to me. It’s very counterintuitive, especially if you’ve just been mixing paint, and dealing in a subtractive color system your whole life. MG: It is totally unexpected the first time you see red, green and blue light mix together into white, it is like magic. JM: Also, touching the space of a light projection and being able to interact with it was an experience I really enjoyed, but didn’t fully understand. Being able to think haptically about a visual experience. I have been try to figure out a physical application of paint that can mimic this, a process that can be interrupted in the same way. Like the distortions created by simply sticking your hand in front of a light source, or angling a projection surface. I want to make room for a similar kind of subtraction and overspill, the mistakes and extra things you can get when you try to control a projection. 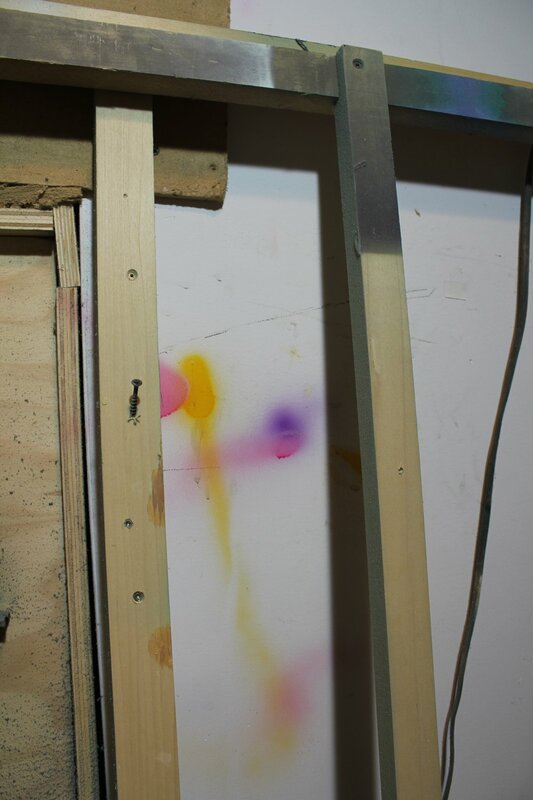 The painting studio—more precisely the event of marking a canvas with pigment—can be interpreted as a similarly reactive environment. MG: Would you say that it was this new found understanding of color as light that led to you to begin working in this way? JM: It was the intersection of a lot of things. I was having this crazy, disjointed experience of color again, after I felt I had become really familiar with painting materials. Working with projection totally defamiliarized me from color. I also had air brushing materials around because when I was younger, 12 or 13, I hung around these auto-body shop guys, who taught me some basic technique while they flamed out cars, and helmets and pulled pinstripes and things. So the airbrush was sort of the spark where I was like ‘let me try to do something where I’m mimicking that experience of a light cone with paint. It occured kind of accidentally, something resembling a photographic process happened with paint that was a visual experience I hadn’t encountered before. I couldn’t put it down. JM: It didn’t look like a familiar mark to me, and that made me realize that this was a project that can go further, get more and more complicated. I’ve been making variations of similar applications of paint, and the color and light space that these create, for about three years now. MT: Can you speak a little bit about how you maintain your relationship to chance and the unknown as you develop your process? JM: Once I feel in control, or I can see a result before it happens, I know I am going in the wrong direction. The way that I’m making these paintings at its core tries to solve a pretty simple problem - how can I use paint like light. That’s the main conceit. Which is impossible, because additive color eventually adds up to black and subtracts the light values out. But, by using objects to block light like you would in the developing room, I’m making the subtractive color system start to work a little bit differently. These paintings become a record of accumulation and subtraction of pigment over varying periods of time using found materials and objects to create marks. The paintings are like an index of their making. Chance and spontaneity are built into the process- within this indirect application, I can’t always predict what’s going to happen when the colors mix on the canvas. MT: James, what is the process like to select the materials that go into these paintings? How do you choose what materials and objects create your marks? JM: I’ve been in the habit of going out on hour long walks with no real path, and collecting things like garbage or branches, really just looking for formal shapes or marks. These become the objects that I play with to generate a composition or a drawing mark. An artist like Tinguely is an amazing to think of in this way - finding potential in all kinds of scrap or refuse and collaborating with machinery to generate a third form. In terms of collecting and figuring out how these objects translate into compositional marks, it is really just a process of recognizing. Something happens- some sort of chemistry occurs between me and and the object. It’s like an act of translation that burns the object into the material. In some cases, I have a clear problem I want to solve. For example, in this painting (CleEl. 2016) I was really interested in lens flares - the history, the mechanics, and what that shape signifies. At that point I was consciously looking for structures that could mimic the shape of a camera aperture, although I wasn’t sure what this painting would become. But I had some sort of visual cue. MT: A mark like this would derive from an object you had found during one of your collecting walks? JM: Yeah, it’s very rare that I’m purchasing or fabricating anything to use for stencils or rigs. MG: Wanting to mimic additive light through the subtractive language of painting is quite a challenge. As a painter you are involved in the timeless pursuit of light, yet you are getting there by borrowing a kind of thinking associated with photography. Could you elaborate? JM: Yeah, sort of. I’ve been thinking a lot about one of the paintings in the Meyohas space for that reason. It’s pretty much a brown-grey field, with clear breaks into RGB swatches or marks. To me that is one of the most awesome painting moments, because the particular color register comes from everything that I didn’t do. I was building up to this neutral brown soup, and by negating areas of application and making different combinations, the blue emerged. It’s the moment that makes the painting, but I couldn’t see what it would be until the very end. It’s a strange and indirect way of thinking about marking and creating colors. You are working in reverse. James Miller. Untitled. 2014-16. Acrylic on canvas. 20 x 16 inches. MG: And you need to think backwards. You are saving parts as you go, but not knowing exactly at the end how everything will work. JM: That’s a good way to put it. It is hard if you are in love with one section of a painting, and you feel like you gotta save that at all cost. I try to keep that in mind, but not be too precious about it. MG: If you don't go far enough you might miss something, but at the same time you risk losing what you have. JM. It’s a real gamble. The paintings do kind of hit a literal saturation point where I’m like okay, it can’t really take on more color without obliterating what’s happened. I often overwork because I want to know what the next relationship could be. A lot of times I wreck paintings by working them into mud. But then sometimes they just sing, and then it’s over. MG: Can you fix them? Can you rework them? JM: No, and I wouldn’t. A lot of these paintings get rips and holes and drips and things, and I like that. The imperfections are what brings everything back from what appears to be a mechanical process and re-enter into a more known language of painting. In some ways, these paintings [can appear to] feel familiar, but when you get closer to them that feeling goes away- I’m interested in this destabilization. MT: It feels like you are figuring out a way to balance a collaboration with a process that depends on the properties and will of the physical materials, while still preserving a space for your intention and your hand. Like, these are process based paintings, but not in the way that would negate conscious intentionality. JM: That guides a lot of the twists- trying to find the limits in which that balance is kept intact. I like when a lot of those choices are made for me, like limitations of size for example. The size of the room in which I’m working formats and builds a limit into the work- the scale of these paintings is directly related to my airbrushing room. MT: Does being in the body that you have narrate your engagement in a particular way? JM: Yeah, the paintings are made back and forth between the wall and the floor, and I’m right over them. 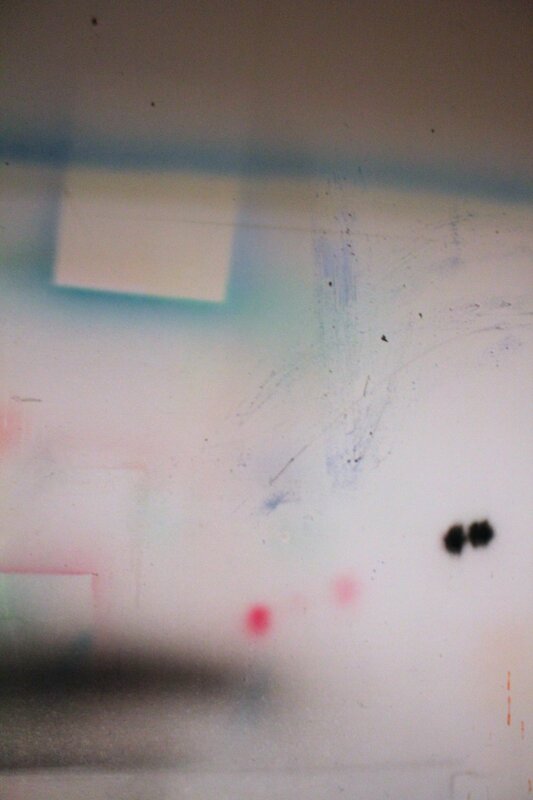 In the Meyohas show, there is this pale yellow and pink painting that is all scuffed up and dirty and stuff. Those are the markings of moving around the painting. And there are times when I want to get out of my body, Working with a winch has been one way that I’ve worked out gestures of painting that have nothing to do with my arm. MT: Is it important to you that your viewers know how elaborate and intimate your processes are when they see your paintings? JM: What I want is for the painting to be be accessible, and seductive in a way that is not overly conceptual or narrative. I want the works to be phenomenological experiences of color that people can access whether they are interested in painting methodology and history or not. There’s nothing here that’s like a magic trick, there’s nothing that shouldn’t be revealed about it. There is a real technical problem set going into these and I’m always happy to talk about the challenges involved in the making. It’s like watching a movie with practical special effects- I always have a stronger reaction to watching a horror movie from like the 80’s, where everything is handmade—pre-CG. These paintings also are made in such an analog way. Appreciating that kind of technical problem solving, and learning more about the material, I think enhances the uncanny-ness of the paintings, you know? MT: Do you see yourself in a particular lineage of painters or other artists? What do you look at? JM: I love Morandi’s seemingly banal situations that become so difficult to reconcile visually. There is so much air and the gravity in those paintings. And then to learn about and see how he documented where the objects sat. I don’t know if you guys have seen those drawings on his table tops? That kind of problem solving is super fascinating to me. Another example is the Xerox machine that Jack Whitten made with two by fours in order to mark his paintings. So those sort of situations or technical issues that lead to this totally other visual experience is really exciting to me. I also love thinking about Kurt Schwitters. The way he crushes everyday materials into a completely other context, and deforms the familiar over and over. Or refuses manufactured meaning. I love that. He is a strong model for me. MT: With how you describe those elements of Whitten, Morandi, and Schwitters, it seems like what speaks to you is how an artist is able to reach abstraction through concrete, or palpable solutions. James Miller. Untitled. 2016. Acrylic on canvas. 68 x 48 inches. JM: I would love to call myself an abstract painter. But I’m not as theoretically oriented as some. I‘m much more interested in thinking with my hands. I think there’s this synthetic, theoretical space that some painters are in, and I’m in a different or more provisional space and time with my work. My work leans towards changing and removing, creating a residue. MG: The result is reminiscent of the feeling you get in a room filled with projected light. You reconstruct that sensation through complicated and very hands on procedures. JM: Constructing has always been a key word for me. Before grad school I was constructing miniature landscapes and making paintings of those. Observing constructions, and observing artifice, and re-representing that. What I’m doing now feels more like a primary way to construct an experience, or a phenomenological effect. There’s a level of weird artificial mimicry going on, but at the same time it’s something I can directly interfere with and touch. I have to think about being in my body, I become part of the painting. MG: As the particles float and settle on the surface do you think about time? JM: I do, I think about time and accumulation. One of the images that it always in my mind is the dust breeding image that Man Ray and Duchamp made. It’s Man Ray’s image of a large glass collecting dust in Duchamp’s studio, and it’s just the most awesome post-apocalyptic landscape: a tangible image of accumulation and time. MG: I feel that in these paintings - through process you are revealing hidden aspects of the objects that generate the marks. 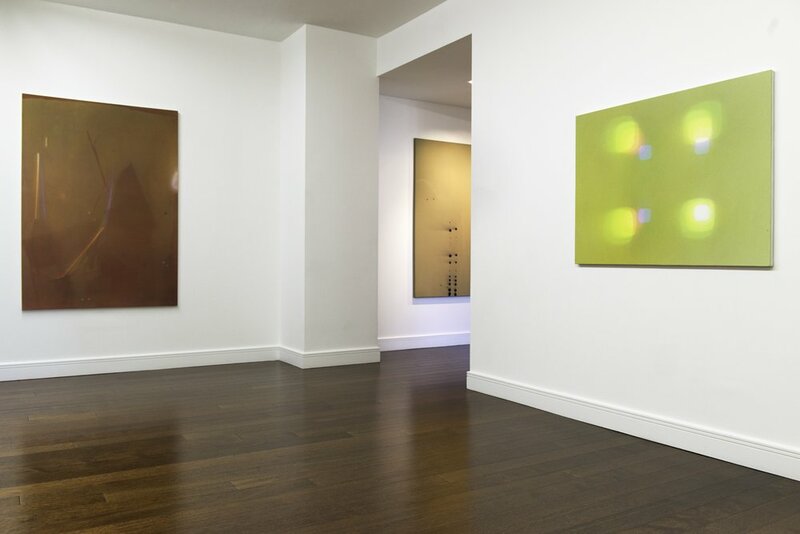 JM: I totally agree with that, you are seeing something that you don’t see, which is a sense of physical touch and an impression made visual that is more about space and particles than it is about light. The other thing I’d like to bring up about light is that it has this other effects, especially over time where it damages, it alters colors or it burns. One of the first people to develop the flash (George Shiras) did it for the purpose of going out at night in hunting expeditions. It also makes me think of Guernica, where the light becomes a kind of invasive presence. MG: Are there specific places that you like to explore in search for objects? JM: I’m always drawn to job sites and demolition sites, places where something happened, where there are obvious traces of an event. On the way to the studio or on a wander, I can’t look away from the residues of car crashes or seeing the guts of a building being demolished. Those things interest me a lot, because it feels like you are accessing the inside, the unseen. Whether the situation tied to this material deposit is banal—or might have been extremely significant to someone—it could be touched and looked at again and folded into a event when brought into the studio. MT: It’s important to me to juxtapose the conditions of your making with the visuals of your surfaces. The end image is so beautiful, and yet the sites from which you gather are places of intense action, or even pain and violence. I’m curious about how these traces brought in through your making reconcile with the aesthetics of your mark. MG: I feel that some of the concerns in these paintings address the core ideas of your previous work. Are those concerns are still present? JM: I do think so, I recognize in the long view of things a common instinct, or at least common obsessions. As a young artist I gravitated towards surrealist paintings and romantic paintings of ruins, structures going down and coming up, and interrupted landscapes. I think I still have a lot of those same aesthetic attractions. But my work now feels more primary, more exploratory than work I was making up until a few years ago. I feel a more tactile and performative involvement not only with the space of the paintings, but also the place of the studio and surrounding environment. MG: It’s like you found a way to access the essence of the subject. This painting in particular (Moro. 2016), to me seems full of feeling, the haziness of the surface creates a melancholic atmosphere. MT: Can you talk a little bit about what kind of relationship you have to emotion in your work, or how you think of your paintings in distinct expression? JM: I think that I am working with a kind of hope in the studio. Gerhard Richter said making art is the “opposite of violence”. How can we witness violence—witness something like the tyrannical coups that is the Trump election—and digest, continue to search for something beyond our limitations. But in general I am emotionally pretty reserved or… I’m kind of a paranoid, but an outwardly mellow person. I think the paintings are somewhat similar…. they have a calm face, but they are made in a pretty frantic way a lot of times. Things can get pretty rough. MG: There is a lot hidden that we don’t see. JM: Yeah, they are just the shadows of a lot of things. You know. James Miller grew up in Spokane, Washington. He graduated with an M.F.A. from the Yale School of Art in 2014, and was a 2014-2015 recipient of the Dedalus Foundation Fellowship. His work has most recently been on view at Mehoyas space in New York and at Untitled Art Fair in Miami. Miller lives and works in Brooklyn, New York.